Preparations are underway as the Monaco Government Tourist and Convention Authority gear towards the festivities surrounding Asia’s second Monaco Film Festival, held in and around the thriving city of Hong Kong. From 1 to 16 December 2018, the Principality of Monaco will welcome festival-goers in a year-end cinematic celebration of the city-state’s notorious glamour, rich history and stunning Mediterranean landscapes at Emperor Cinemas (Entertainment Building), with fringe events including exhibitions, galas and parties planned around the city. From 6 to 13 December, Opera Gallery will showcase the paintings and illustrations of Elizabeth Wessel, an acclaimed Monaco based fashion designer whose artistic sensitivity and expression is seen through the prism of Fashion. Explore her signature slender and vigorous characters – inspired from her stylised Haute Couture sketches and painted with forceful and concise strokes, evoking the spectacular aesthetics of Art Deco. A hub for the purveyors and collectors of modern and contemporary art, Opera Gallery will be hosting an invite-only opening reception on the evening of 5 December, where the artist will also be present. For more information, please visit http://www.operagallery.com/hong-kong. Created in Monaco by Riccardo Giraudi in 2005, Beefbar offers a wide selection of the best beef origins & cuts in the world in a unique and luxurious setting. In celebration of the Monaco Film Festival, the one-Michelin-starred Hong Kong outpost will be serving a Monaco themed menu from 7 to 13 December. Indulge in a traditional Socca with tuna tartare (HKD 280++), pillows of Potato gnocchi, Kobe Cecina & white truffles (HKD 980++), or a decadent Crêpe Suzette (HKD 110++) flambeed to perfection. For reservations and more information, please visit http://hk.beefbar.com. 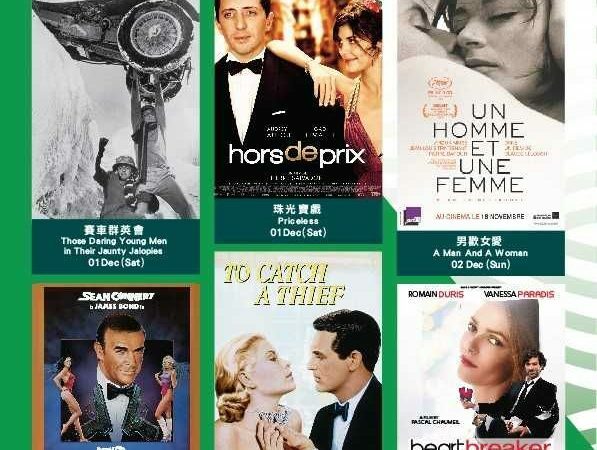 Movie buffs can expect a spectacular selection of films shot in and around Monaco through past decades to present day—from vintage classics such as “To Catch a Thief” (1956) starring the iconic Hollywood-turned-Monaco royalty Grace Kelly, to modern-day documentary “Monaco: Back to the Future” (2017) highlighting the Principality’s longstanding pursuit of ground breaking technologies in the last 100 years. Those who’ve never been to the second smallest country in the world can expect to be taken through the stunning landscapes of Monaco, Monte-Carlo, the Mediterranean Sea, and more. From the iconic picnic scene in “To Catch A Thief” that overlooks Monaco from the edge of a cliff, to the scenes of the Monte Carlo Rally along the picturesque roads of the French Riviera in “Those Daring Young Men in Their Jaunty Jalopies”. This is the perfect event for film enthusiast to see how the Monégasque cinematics have evolved in the last 70 years – from techniques that were once considered groundbreaking to the advancements that we witness today, and how scenes from the 1966 French film “Un Homme et Une Femme“ segued between full color, black-and-white, and sepia-toned shots, set against a memorable musical score by Francis Lai. The full programme of the film festival is listed below. Tickets can now be booked at the Emperor Cinemas box offices and the online at the official website https://www.emperorcinemas.com/ as well as its mobile app.